Chances are that you’ll have already seen hundreds of photos of Bodiam Castle – even if you’ve never heard of it until right now. Bodiam is so picture-perfect that the image of the castle, emerging from a misty moat, has been emblazoned on thousands of tourist brochures, books, chocolate boxes and tea towels, and shipped all around the world. In fact, Bodiam is often portrayed as ‘the perfect English castle’ – a jostling crowd of tall, grey stone towers protected by square battlements, secured with a round drum tower at each corner, and wrapped in a reflective moat. It’s just as impressive in real life as it is in the pictures. When I visited in Autumn 2012, a crowd of American tourists literally stood agog in front of Bodiam – speechless as it’s all-too-perfect exterior. Don’t be too seduced, though: appearances are deceptive, and the genius of Bodiam Castle only becomes apparent when you start to look a little deeper. . .
Is Bodiam the perfect English castle? Its spectacular appearance dazzles tourists from both the UK and much further afield. Bodiam Castle was built from 1385, and there’s an unsolved puzzle at the very heart of the castle. Essentially, historians are pondering whether the castle’s perfect appearance is too good to be true. One one side, some scholars argue that Bodiam was built as a Medieval romance – a grand country home designed to evoke the majesty and power of other English castles, but with little intention of ever being used in battle. However, opposing historians counter that the castle really was a ferocious and formidable fortress, that just so happens to look perfect to the foolish minds of modern visitors. There are four round drum-towers – one at each corner of the castle. The walls are studded with towers and other outbuildings, giving the impression of grandeur and complexity. Academics have argued the point for many years, and no-one has drawn a definitive conclusion. My own interpretation – although I’ll try to be balanced throughout this page- is that Bodiam was built more for spellbinding style than for battle-hardened substance. However, whatever your interpretation, there’s no doubt that the castle is a phenomenal example of Medieval architecture. The fact that we can’t quite fathom the architect’s original purpose doesn’t make it any less authentic or impressive today. Even nowadays, the approach to Bodiam Castle is remarkably impressive. As you draw up towards the castle via the gravel car-park, it’s possible to glimpse the warm grey stone towers appearing from between wizened English oak trees. So just imagine how how spell-binding the first glimpse of the castle would have been back in the late c14th. This is a view looking out of the Postern gate at the back of the castle – looking across the castle moat. Sir Edward Dalyngrigge, a member of the medieval Sussex gentry, was granted license to build the castle back in 1385. Apart from his fantastic surname (akin to someone from Harry Potter), Dalyngrigge was an important member in Sussex politics, and a man of arms – he fought on numerous occasions in the Hundred Years War in Europe. Dalyngrigge was never an important figure in national politics of England. But in 1385, likely in recognition of his military service, King Richard II gave him license to ‘crenellate’ -a license which allowed the creation of battlements, and thus a castle. This is an important point for some academics. Surely a castle granted to a military man – in recognition for his military work – would naturally be designed as a defensive fortress? One of the huge drum towers at each corner of the castle – an impressive display of the castle’s might. There are further clues to the purpose of Bodiam. Being located in the south of England – close to the French border – logic would dictate that Bodiam was built as a military stronghold to protect us all from a future invasion from the pesky French. However, hold your horses – some scholars have argue that the castle is so far from the coastline that this theory seems implausible – and, by 1385, the continental threat was greatly receding. Even so, the setting of Bodiam Castle was indisputably picked with exceptional care. Rather than just rebuild his manor-house, Dalyngrigge picked a particular spot in the middle of his land – a natural dip overlooked by a number of gently sloping hills. Why choose such a specific setting? One of the reasons was that this shallow basin was perfectly suited for a vast moat. View of the residential rooms of Bodiam from the Gatehouse tower. Note the profusion of fireplaces built into the walls. The grand moat which circles Bodiam Castle is undeniably impressive. It’s part filled by a natural spring, and perfectly encircles the entire castle – providing a stunning reflection if you’ve brought your camera (or a noisy feeding ground if you’ve bread for the vast numbers of ducks!). There were two possible entrances to the castle across the moat – via the Postern Gate at the back of the castle (facing the modern car-park) or via the main Barbican on the opposite side of the castle. Anyone wishing to enter via the Barbican (now demolished; it would have stood on an island separated from the main gatehouse) would have had to cross the moat using a lengthy wooden bridge which lead to this defensive tower, guarding the castle’s entrance. The modern entrance bridge crosses to the barbican (no longer standing; it would have been upon the grassy island) and then crosses again to the main gatehouse. The medieval wooden bridge wound to the barbican in a more circuitous route. Attackers would have struggled on approach, as the tortuous wooden walkway – which wound through the moat, rather than directly crossing it – would have made them very vulnerable to arrow-fire from the castle. Even if the attacker made it to the Barbican, the next problem would have been entering the gatehouse. It’s likely that there’d have been a second small wooden bridge linking the two buildings – but, even past these obstacles, the Gatehouse is filled with numerous intruder-traps, including holes for boiling oil. The defensive appearance of the castle is capped by a magnificent, round drum tower at each corner – perfect for launching arrows at attackers, or keeping a close eye on approaching intruders. To the casual observer, then, Bodiam does appear to have been designed with defence in mind – but it’s worth having a closer inspection. To an untrained eye, it certainly looks like the castle moat was built with defensive intent. But this may not be the case. Modern day scholars have discovered that the castle was built using an architectural technique called ‘forced perspective’ – an optical illusion that’s been used in many modern buildings, including all the Disneyland castles. The behind of Bodiam Castle – you can see the Postern Gate in the middle. Forced perspective is an intentional trick of making details in the upper reaches of a building – in this case, the upper windows and towers of Bodiam Castle – smaller than usual. Indeed, the windows in the upper floors are much too small to be used as arrow-slits; and the battlements of some of the teetering top towers are absolutely minuscule. These disproportionate-sizes create the illusion that the building is much taller than it actually is. The trick becomes quite apparent if you stand close to the building and look up at it – the design only works when the observer is standing some distance away. The small windows of the castle are neither designed as arrow-loops, or really sufficient to act as windows. It’s another piece of evidence of the forced perspective design. Academics have then hazarded that the moat was an intentional bit of architectural trickery – as it forced observers to stand some distance from the castle, and to be awed by the full effect of the forced perspective. Most modern day visitors become conscious of the trickery when they enter the castle – it’s much smaller inside than you’d ever imagine from its outer appearance. Why go to such effort? Well, I’d argue that Bodiam was built to conjure ideas of grandeur and prestige. Forced perspective exaggerates the scale of the castle – and Sir Edward Dalyngrigge had other tricks up his sleeve which were designed to impress. Modern day archeologists have found evidence of a series of eight, shallow water-pools surrounding the castle, which would have dazzled visitors with dramatic reflections of Bodiam seen from every angle during their approach. You’ll find the deep, green, and perfectly circular well in the south-western drum tower of the castle. Sparkling, reflective water seems to be a motif of Bodiam Castle. There is further archeological evidence – this time in the form of the shallow, flat-topped hill with sits behind the modern-day ticket office and museum (and is presently used as an English vineyard). The top of the hill, evidence shows, used to be a viewing platform – perfect for gazing down at the beauty of Bodiam Castle which lay below, surrounded by glistening pools of water. To me, this is the clinching piece of evidence that shows that Bodiam Castle was designed for looks rather than defence. There’s no doubt that this castle was the work of a genius – but a genius who wished to prove his significance in the world. Although Bodiam has the look of a fortress, it’s really a dramatic demonstration of power and of prestige – using every architectural trick to puff itself up into dizzying performance. The interior of Bodiam. Again, note the profusion of small turrets atop of the larger towers – lending the castle a grander and more impressive silhouette. I believe that Sir Edward Dalyngrigge set out to build a castle to embellish his name and prove his importance – and, 600 years later, thanks to the genius of Bodiam Castle, he remains unforgotten. I’m sure that’s exactly what he would have wished for!! If you’re interested in visiting Bodiam Castle today, you’ll really need your own transport at your disposal. The castle is on the outskirts of the small village of Bodiam, on the border of East Sussex and Kent. It’s about a 30m drive from Maidstone or Tunbridge Wells. For a more interesting approach, a steam railway runs between Bodiam and the picturesque nearby town of Tenterden. The railway, which is seasonal, runs impressive steam trains through the some beautiful spots in the Kent countryside and finishes up around a 10min walk from the castle entrance. Me, clearly getting a bit too excited about reading a massive wooden book inside Bodiam. You certainly couldn’t steal that thing. You could drive to Tenterden and do the railway and subsequently the castle as a day-trip from there. Tenterden is full of historic B&Bs and pretty lodgings, and is much more pleasant than some of the rather depressed country towns and villages elsewhere in Kent. When planning your day out, do be warned that there’s not much else to do in Bodiam, save for an okay-ish pub opposite the castle, called the Castle Inn. The castle itself is managed by the National Trust, and has an obligatory chintzy tea-room out front. There’s a good museum opposite the main castle entrance, and inside the castle you’ll find a few interesting exhibits and an interesting informational DVD recording. What plunder made Sir Edward Dalyngrigge so rich? What other architectural tricks were used in Bodiam Castle? And why was Dalyngrigge’s mentor – Sir Robert Knowles – so reviled? 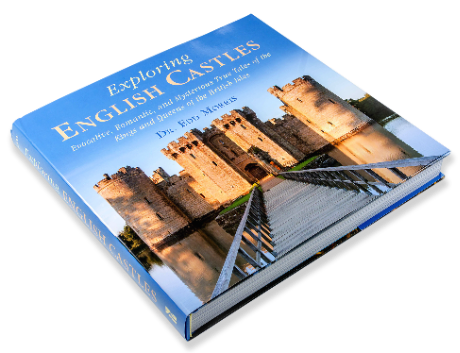 If you’d like to unearth more mysteries of Bodiam Castle, you need my first print book, Exploring English Castles.